Autumn has officially started along with the season's favourite activity - apple picking. Not only is the fun in the picking, it is also bringing those apples back to the kitchen, then cooking and baking them up every which way possible. Aside from being a source of fun activities, apples are very nutritious and helps a lot in keeping us healthy. Apples contain less than 100 calories in a medium-sized apple, which makes it a healthy snack even for people trying to lose weight. Even better news, apples are also free of fat, sodium and cholesterol. A medium size apple also contains 4 grams of dietary fiber, which is 17% of the daily recommended value. So eating an apple a day helps with digestion. Apples also provide antioxidants and phytochemicals that help prevent a number of chronic diseases like Alzheimer’s, lung cancer, heart disease, breast cancer, diabetes, etc. Apples also help protect brain cells because it contains quercetin in the skin. Apples rank low on the Glycemic Index, which measures how rapidly carbohydrates in a food boost blood sugar. 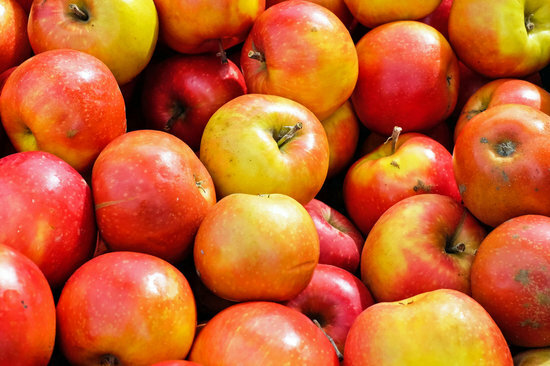 Apples contain boron which helps protect bones. From sweet desserts, to savory soups and fresh salads, this recipe will help you make the most of this year's apple pick thanks to thekitchn.com. Once the apples are tender, drizzle in 2 tablespoons of honey. You can add more depending on desired sweetness and taste. Scrape the apples into a bowl to cool slightly. They can be served over the chilled custards. For more healthy recipes, go here. Honey Custards with Caramelized Apples photo courtesy of thekitchn.com.